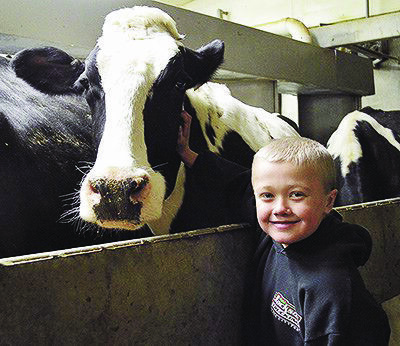 Nine-year-old Tyler Holst of Zumbrota, Minnesota, was born with multiple congenital heart defects. By the time he was three years old he had already endured three separate heart surgeries. Unfortunately, his heart continued to deteriorate as he grew older and in November of 2016 Tyler was placed on the heart transplant list. The family continued to wait patiently to receive the news of a new heart. As members of National Mutual Benefit, Tyler’s parents, Shane and Casey, have a great relationship with District Representative Floyd Kitzmann. It didn’t take long before NMB Branch 935 of Red Wing, Minnesota, along with Floyd and his wife, and many other families, friends, and community members joined together to plan and hold a benefit for Tyler in Mazeppa, Minnesota. This past June, over 800 people showed up for an entire day of carnival games, live music, raffles, and many more fun activities to help raise money in the hopes of easing the financial burden on the Holst family. “The local school was involved and hosted the kids’ carnival, which brought in a ton of kids, plus, while the live auction was taking place, the kids watched a movie which kept people there longer,” NMB Branch 935 President Rachel Aslakson shared. Fifteen members of National Mutual Benefit Branch 935 were involved in volunteering at the benefit, and purchased many meat trays to raffle off on the day of the event with proceeds going to the family. When all was said and done, the benefit raised nearly $80,000, including $2,500 in matching funds from National Mutual Benefit, for the Holst family to use for medical and travel expenses. We are extremely proud of our group of members in Minnesota, along with the other volunteers who helped make this all possible. On Monday, September 24, Tyler received the best gift of all—a new heart! Tyler’s mom, Casey, is staying with him at the hospital as he continues to recover and grow stronger every day. We wish him the very best on his journey to healing.